Estonia, Nov 5, 2018: Fram2Kitchen Innovation OU, a technology startup which is developing a unique Global Farmers Marketplace offering Food Traceability on Blockchain is scheduled to launch a crowd sale on 5th November. The company released its Minimum Viable Product (MVP) on November 1, a base platform and Mobile App for member signup and onboarding. Proceeds from the crowd sale will be used for expansion of the company’s software platform to add Farm Management capabilities and accelerate the use of artificial intelligence (AI) applications to drive efficiency in food order processing and delivery route planning. 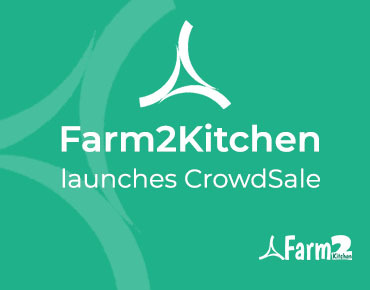 Farm2kitchen will also use the funds to ramp up sales and marketing of the recently launched Blockchain platform, which will serve as the foundation for Farm2Kitchen enhanced platform. Combined, these technologies will redefine the field of Food Procurement, Supply Chain and Traceability and be the impetus that accelerates availability of heathy food for all. Farm2Kitchen Innovations OU, an Estonia registered company, is developing a Global Farmers Marketplace andFood Traceability platform by utilizing the Blockchain technology of distributed ledger and smart contracts to uniquely track every step of the food delivery on a shared ledger in order to ensure transparency, Food Safety and provide the foundation for sustainable agricultural growth and food security. Farm2Kitchen will make the technology platform available on the public Cloud as a Software as a Service (SaaS) application on subscription basis for all food supply chains users around the world to participate.